Miha Miskovic saves a shot. 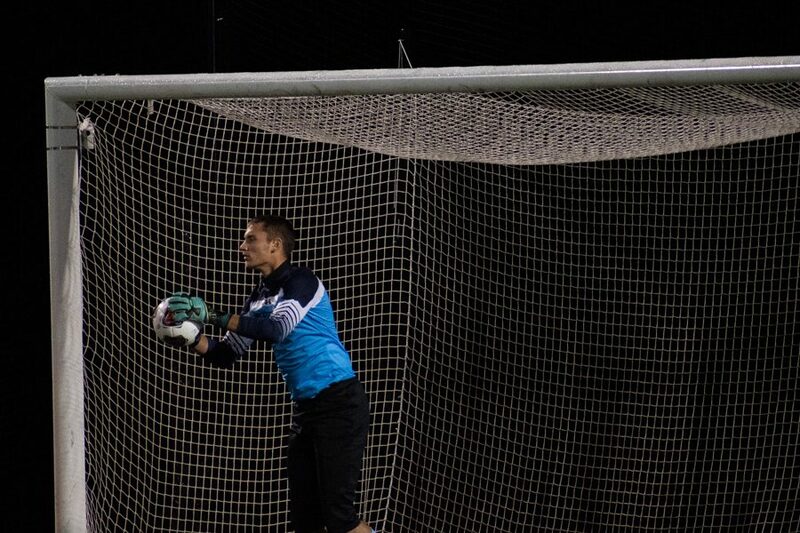 The sophomore goalkeeper has 33 saves on the season. After losing to No. 19 Michigan at home on Saturday, Northwestern has another chance at Martin Stadium to end its current four game winless streak. The Wildcats (4-4-2, 0-3-1 Big Ten) have faced ranked opponents in their last two matchups and Tuesday’s matchup against No. 20 Notre Dame will be no different. The Fighting Irish (5-3-1, 2-1-0 ACC) have gotten lots of production from unlikely sources as their two leading point scorers are defenders. Patrick Berneski and Felicien Dumas have combined for 18 points this season and Berneski is leading the team with five goals. Along with the stellar play of Notre Dame’s defenders, midfielder Aiden McFadden is the team’s second leading scorer and is currently on a hot streak, having scored in the past two games. Notre Dame has gotten off to a fast start this season, aside from a three game losing streak, including losses to two Big Ten opponents, No. 2 Indiana and No. 5 Michigan State. NU plays better when it possesses the ball more and looks to move the ball into its attacking third, which the Cats did in the second half of their game against Michigan. In their three matchups against ranked opponents this season, they have done the opposite. Then-No. 15 Fordham, then-No. 2 Indiana and then-No. 19 Michigan have averaged 19.33 shots per game on the Cats, while NU is averaging just 5.33. An even more alarming stat is that NU has been outshot 30-7 in the first half by those three opponents. The Cats have taken just one first-half shot in their last two games. Coach Tim Lenahan said he wants his team to take the positives from their previous games and apply them against Notre Dame, regardless of how the score turned out before. Lenahan added that his team needs to play harder and come out with more energy in the first half, which is something it didn’t do in the first half of their game against Michigan. In the second half, the Cats looked like a different team. Their offense functioned smoothly, with crisper passing that created better ball movement. Sophomore Miha Miskovic said their success in the second half was a building block for their game against Notre Dame. Along with coming out faster, Lenahan said his team needs to play smarter as well in order to win big games like Tuesday’s matchup.